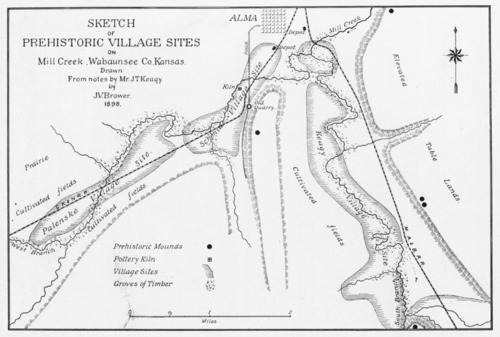 This is a photograph of an 1898 map drawn by J.V. Brower, from notes by J. T. Keagy aboutt archeological discoveries near Mill Creek. Keagy was a Wabaunsee Co. pioneer and County Attorney. and his son, J. A. Keagy. Brower, a writer and amateur archeologist, met Keagy while the former was staying at the Alma Hotel. Keagy, an avid arrowhead hunter, commenced intensive searches along Mill Creek and west of Alma. Fifty years later, Bob Grunewald hunted arrowheads and his collection surpassed Keagy's in both quality and quantity. An archeological dig, sponsored by the University of Kansas, conducted on Mill Creek, near Kuenzli Creek Rd. in 2003, revealed late paleo era artifacts dating 8,800 years ago.